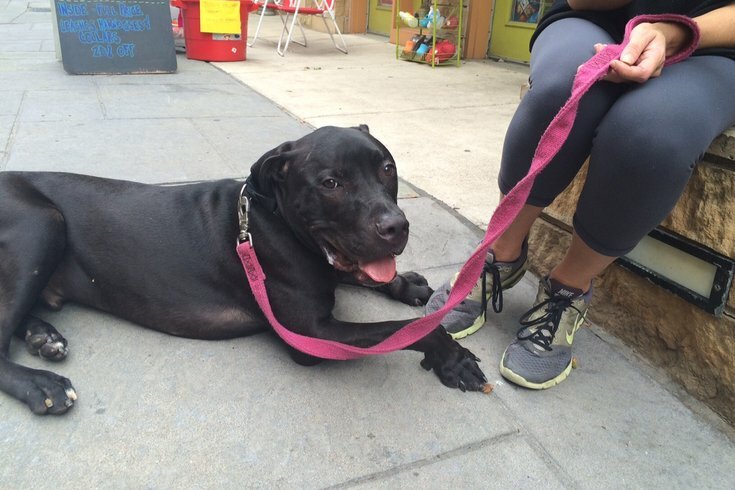 Oswald Cobblepot is one of the dogs available for adoption at Street Tails Animal Rescue in Northern Liberties. Francis of Assisi is known as the patron saint of animals. But as his namesake, Pope Francis, prepares to visit Philadelphia, shelters and adoption centers are facing the challenge of taking care of their cats and pups while the city is on lockdown. “It’s hard to predict what it’s going to be like,” said Ray Little, director of the Saved Me Adoption Center in Northern Liberties. The adoption center will be open during the papal visit, but its one employee who lives in New Jersey will not be able to make it in. The center hopes to get volunteers to help out with walking the dogs, socializing with animals and cleaning the shelter. Just a few blocks away is Street Tails Animal Rescue, which is trying to place all of its current dogs in foster homes before the papal visit. The rescue stopped taking in new animals about a week ago and will be closed Thursday through Monday during the pope's time in Philadelphia. “As they’ve been adopted out, we have not pulled out new dogs from Animal Control or the other facilities that we pull from, because of the fact that we have to foster them out,” said the manager, who preferred not to be named. “What stinks is when we don’t pull dogs for Animal Control, that means more animals are being put down,” she lamented. Almost all the dogs at Street Tails have a confirmed foster home except for one lovable pooch named Oswald Cobblepot, who requires more care because of his disabled paw. “For any dog with special needs, it’s going to be more of a challenge,” said employee Allison Lewis. Thankfully, Street Tails has found one foster family who will be able to take care of Oswald for at least part of the weekend. Street Tails and Saved Me can be grateful that they are at least outside of the Center City traffic box, where all incoming traffic will be blocked this weekend. At the PAWS Old City Adoption Center, volunteers will have to brace themselves as they wade through the massive crowds flocking to hear Pope Francis speak at nearby Independence Hall. The adoption center will be closed, but the 40 to 50 cats who live there will remain. (The center had only two dogs and both are in foster homes.) Volunteers will walk to the store to feed them. “They’re going to make the trek to get here to take care of all the cats that are here,” said Wiltzius. This dedication to animals would no doubt make Saint Francis smile.